1. Where we crossed the stream, we came upon two poor huts belonging to heathens, built of branches with a little grass atop. As soon as they had heard us, we saw ten heathens running away like deer from those little houses, and although they were shouted and signed to, not to be afraid of us, they paid no attention save to run faster. We stopped for a while close to their poor little houses, which were at the edge of the same running stream, and amused ourselves for a bit in examining a great many traps that they had constructed in several spots, a sort of fish-traps, made out of rushes, by which they were catching a great amount of small fish, or so the soldiers assured us. . . . One of these streams flows at ground level, and along the whole length of its course, which is quite far, the heathens belonging to this spot have set snares, a kind of fish-traps staked down and stretched all along the water's course, some twenty of which I saw within a short distance, and the soldiers assure us they catch large amounts of fish in them, piles of which they had seen while scouting through here. 2. There is a positive maze of very large freshwater lakes with a great deal of swamp and bulrush patches in this hollow, and I know not how many large running streams, and two or three very large heathen villages. Our captain told me that when they explored here last year, there was a village close to the lakes, some of which we saw from afar off, and they had several tule-rush floats with oars [sic], with which they fished in the lakes. We saw four heathens running far off at a trot, obviously going to give warning to the other village that was said to be farther up along the route we were following. . . . We came to a very full-flowing stream which it took us some trouble to cross because it had so much water, and close to this there was a very big heathen village where as soon as they saw us they commenced a bit of a disturbance, while we were forced to pass close to it in order to follow the route. Our captain went out ahead toward it with some soldiers, and they at once went inside their houses, of which we counted some thirty-odd, roofed with grass. (In order to get from one side to the other of the stream we had crossed, the heathens had made a bridge, of hurdles, as it were.) The village must have lain a bit over a musket shot away from this stream. We followed the well beaten trail of the heathens beyond this stream, and they had driven four arrows in the ground in two separate places and, from the village, were signing to us to take those arrows. Our captain, who, as I was saying, had gone out ahead took two of them, as did the soldiers with him. The captain gave them beads but they would not take any nor could he get any one of them to go with us and show us the way. We spent a good while stopping here, and then went on, and on going a short way had to cross another, larger running stream with a great deal of water; both streams being well lined with cottonwoods and sycamores. (Immediately after crossing the stream we saw a swarm of heathens who had issued from their houses where they had hidden at our arrival). 3. On the whole day's march we saw not a single heathen. (Before reaching here we passed a large abandoned village close by which there was a well constructed square pen, with seven or eight tall poles in it with bulrushes hung on them.) It was only on our reaching the place where we camped that some fourteen heathens met us, most of them well armed with good quiversful of arrows and even better short bows, very well wrought, like those on the Santa Barbara Channel, unless indeed these are better than they. Two of them came up with their whole bodies painted white and commenced shouting and preaching at us. Our captain went out ahead with some soldiers and distributed beads to them, as did I, and they were mollified and sat down for a while with us. On a knoll close to another small stream a village having seven houses is visible about half a quar-ter-league away from us here, with another village at about the same distance in a hollow along the course of the small stream where we are; and we viewed two large smokes. 4. At around about two or three leagues, we passed by five villages belonging to very good well-behaved heathens, all of whose villages lay in this enormous plain at the banks of running streams at the foot of the range. All the villages had the usual well made houses, although few of them, as we counted eight houses only in a single village, the others having three, four or five of them, roofed seemingly with rushes. The men almost all wear their hair long; nowise are they unruly, for as we passed not very far off from them they would give an occasional shout, while others stood quite silent not making a sound. . . . We saw several smokes over close to the inlet. . . . A few heathen men and women passed by close to us as soon as we had reached this spot; we had seen them afar off across this wide-spreading plain. 5. We met with a fine little village at the other side of the stream, belonging to very fair-haired, well-bearded heathens who showed so much happiness that they were at a loss how to handle us, but gave us long speeches; they gave us several bowls full of a sort of barbecued small onions, which I tasted and found to have a very agreeable sweet-sour flavor. The captain and myself gave them beads, and they made him a present of a sort of very well made cords of featherwork, and two dried stuffed geese. These they must have had some three dozen of, made for the purpose of hunting other [geese], and they are so well prepared they seem as though living and anyone would be fooled into thinking them alive. We went onward and shortly came upon another village of the same good folk; and seven or eight heathens belonging to the first village went with us a long way at their own instigation. All of them were going unarmed except for two of them carrying two goodsized quivers full of very good arrows, all of which had black flints, and with very well made short bows. . . . On our reaching here," just like the last ones they came over from another village, belonging to this place. Some eight of them came, and as they approached one of them was dancing, with a pipe in his mouth and wearing a large feather headdress. They presented our captain a flag made out of feathers and a net that the dancer had been carrying; they also presented him with a carved black stone pipe of the sort they use to smoke with, that was very fine. We made them a present of beads and meat from the bear that was killed yesterday; they sat with us a good while and then went off very well satisfied. We were greatly pleased with this heathen folk; they are like just so many Spaniards. 6. We have come across four or five villages of very fine well-behaved heathens, very fair-haired, bearded and whiteskinned, all of whom were dying for us to come to their villages and have them feed us." We have passed through three or four of the villages and in each one they have presented us with a great many servings of cacomites and amoles: cacomites are a small round root only a bit larger than a large hazelnut, while amoles are a small root like an onion, and they gave us good-sized servings of both sorts, some of them being only barbequed while others had been dried in the sun after barbequeing. Both kinds had a good sweet-sour flavor that was very agreeable to the palate, and this," by what we saw, is their food and daily bread. In the villages are four to six houses, roofed with grass. 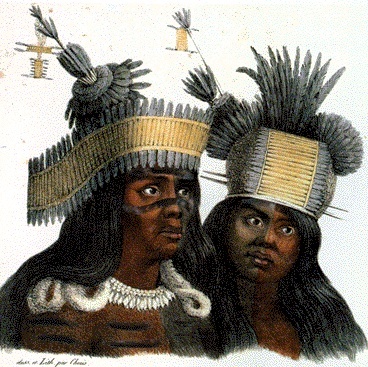 The heathen men here wear their hair long, most of them having it tied with cords twisted out of skins and feathers," and resembling a great deal the men on the Santa Barbara Channel." The women go about more decently than the ones at Monterey, for the ones we have noted here are well covered by hides wom in front and behind. Their bows and arrows have no difference from the ones on the Channel. We have seem a great amount of mussel shells at each of the villages. But the heathens here beat those of the Channel in point of whiteness; we have seen several boys and youths seeming to be nothing else but so many Spaniards in whiteness-and the folk are all exceedingly well behaved. As soon as we would set out from a village they would accompany us at their own instigation as far as the next village or for a long stretch of the way, all of them very happy, without a single weapon. -Let us return to the inlet which we were following along. At once we commenced hearing shouts as though of people calling to us from the other side of the inlet which as I have said is a quarter-league or half a quarter in width. And at once we saw some of them coming over rowing floats or canoes. We ourselves went onward but the men coming behind with the pack team reported that they had crossed over in tule-rush floats. Using signs, we asked the heathens here whether this inlet ran far along, and we understood from them that it did but that it spread out a great deal in the distance. 7. We met with two more large villages that must have been a quarter-league apart from each other. We passed through one of them, which was on the way that we were following. There must have been not under about sixty or seventy grown men, besides a great many women and boy and girl children. We stopped for a bit to give them beads, and they were not disturbed at all. They were very tall, fair-haired and white men; all of them were standing outside their houses, without a weapon in sight in their hands. 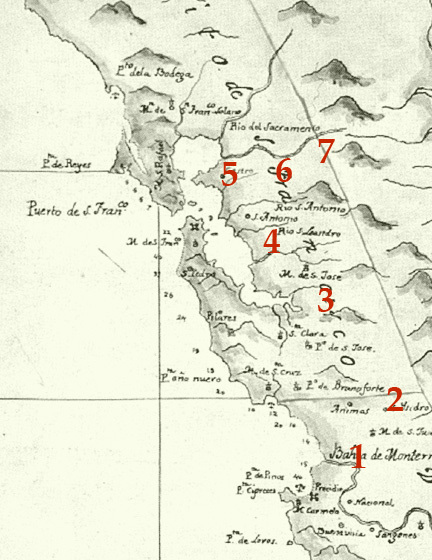 All of the villages this far up seemingly have a great deal of the Monterey language, since we hear orres, which is "bear," cattaus, "brother," tot, "deer," and other terms, from them.